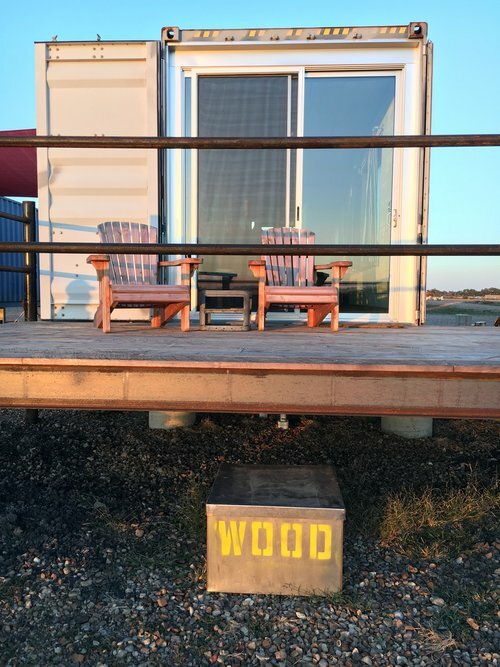 Check out the list of Shipping Container Houze's that we have open, check their availability and book your stay at Flophouze today. 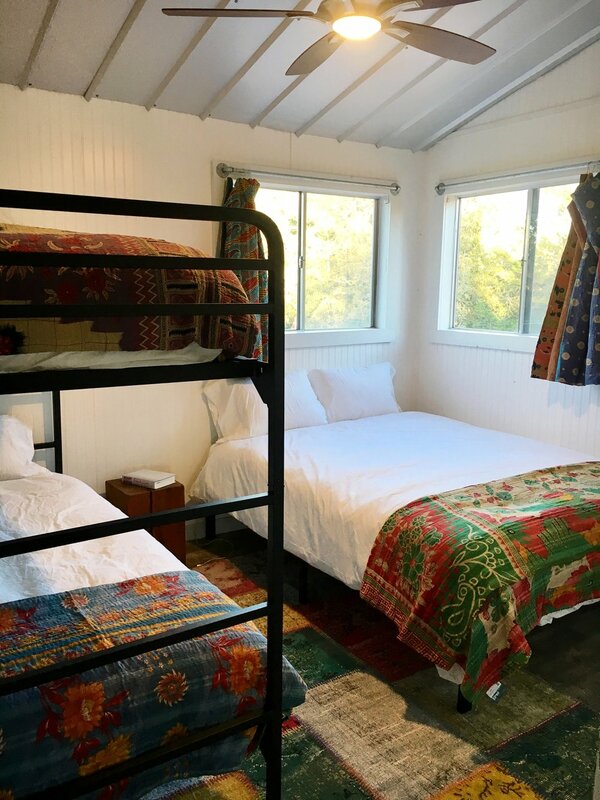 This unit will sleep 3 comfortably but can accommodate up to 4 people upon request. There is a beautiful queen size bed at one end and a full sized couch in the living area. An efficient hollywood bathroom separates the space. The kitchenette features a sink, microwave, mini fridge and a chemex coffee maker for the morning get up an goers! This unit will sleep 4 comfortably. There are two twin size beds at one end and a full sized pull out couch at the other end of the 300 sq. foot space. An efficient hollywood bathroom separates the space. The kitchenette features a sink, microwave, mini fridge and chemex coffee maker for the morning get up an goers! This unit will sleep 3 comfortably but can accommodate up to 4 people. There is a beautiful queen size bed at one end and a full sized couch in the living room. An efficient hollywood bathroom separates the space. The kitchenette features a sink, microwave, mini fridge and coffee maker for the morning get up an goers! Our "funky "cow"abunga" Houze IV- Has a private room featuring a beautiful queen size bed with twin bunk beds at one end and a comfortable full sized pull-out couch in the living room- An efficient hollywood bathroom separates the space. The kitchenette features a sink, microwave, mini fridge and chemex coffee maker for the morning get up an goers! Our "picasso" Houze V- Has a private room featuring a beautiful queen size bed with twin bunk beds at one end and a comfortable full sizedcouch in the living room- An efficient hollywood bathroom separates the space. The kitchenette features a sink, microwave, mini fridge and chemex coffee maker for the morning get up an goers! Our "smooth sailin" Houze VI - Has a private room featuring a beautiful queen size bed with twin bunk beds at one end and a comfortable full sized sofa in the living room- An efficient hollywood bathroom separates the space. The kitchenette features a sink, microwave, mini fridge and chemex coffee maker for the morning get up an goers! 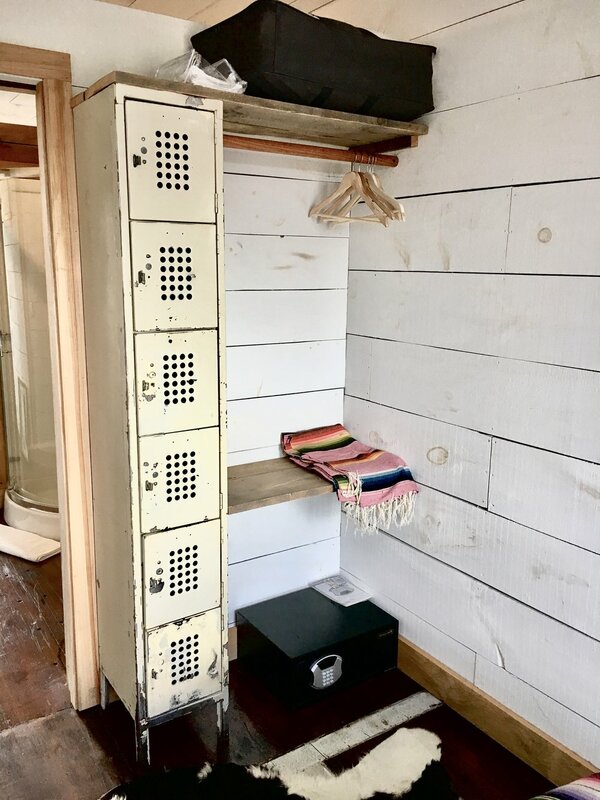 Two bedroom, one bath, sleeps up to eight guests. 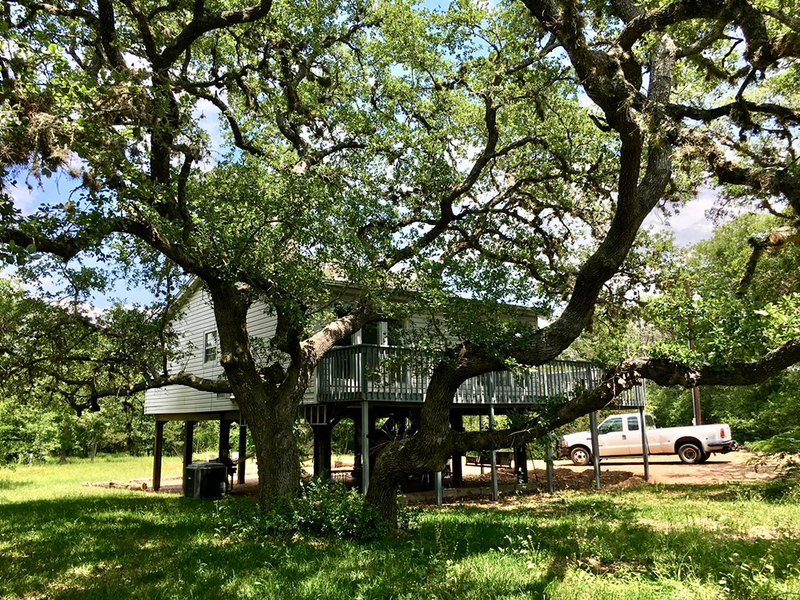 Nestled amongst the live oaks, our newest Flophouze Rental is a two bedroom one bathroom tree house style loft close to Excess Field in Warrenton- just a few minutes away from the heart of Round Top. The House was originally built by hippies in the 1970's who were looking to escape the chaos of the big city. 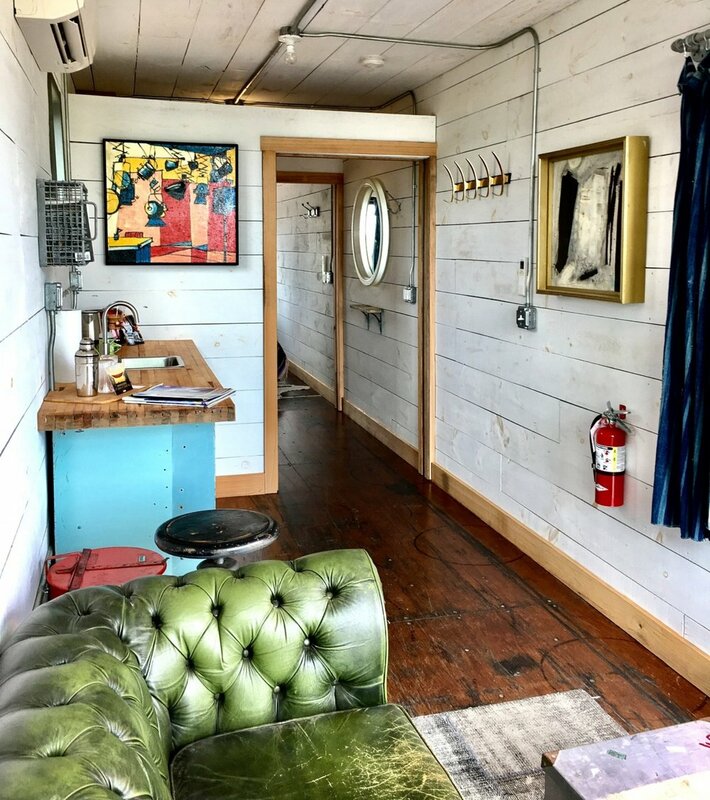 Matt White, owner of Flophouze and Recycling the Past, immediately fell in love with this unique haven and purchased the property a few years back. 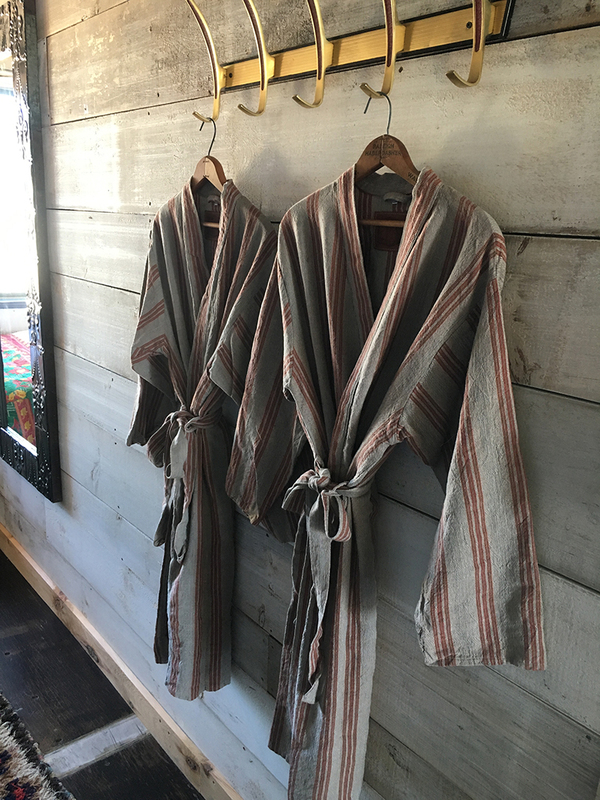 Up until now, he's been using it as his own personal residence during his visits to Round Top and is now offering it to our guests as a place to stay. "I've traveled all over and The Beach Houze is hands down one of my favorite places to be. The Houze is on stilts with hammocks and an awesome hang out spot below, so It's got that chill "Beach House" vibe- but instead of the beach you got this huge stocked pond, 10 acres of trails to explore and this badass wrap around deck up in the trees- it makes you feel like a kid all over again. I think the reason this place is so special to me is because it combines two of my favorite things, things that rarely ever go together, in one spot; The Country and The Beach. Providing unique experiences is what the Flophouze Brand is all about-its what we live for, so of course we had no other choice but to add this to our fleet and share this amazing experience with our guests." The BeachHouze boasts an open kitchen, living and dining area. Bedrooms are set up with one queen and one adult sized bunk bed - add the couch in the living room and this place is perfect for larger groups. 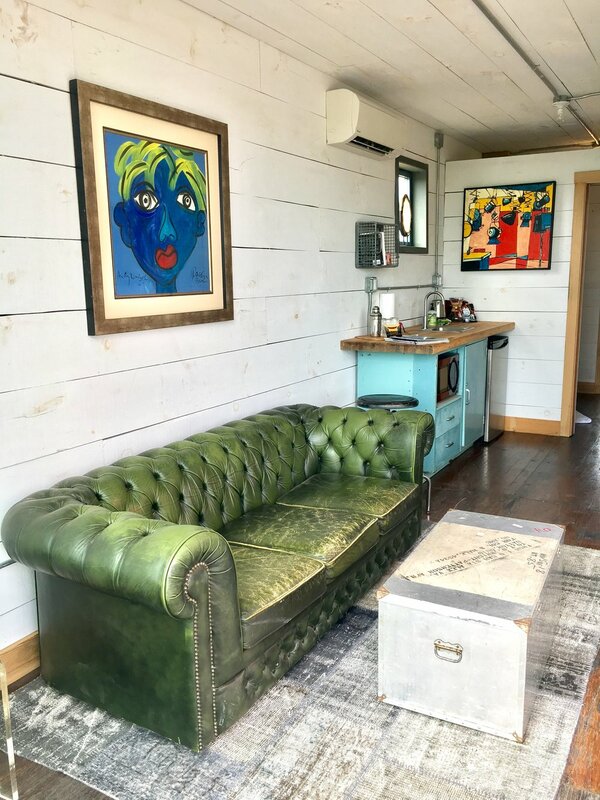 With a focus on Mid century design, this Houze is filled with unique vintage items from a simpler time when the focus wasn't on quantity but instead on simplicity and quality craftsmanship- something we admire greatly and want to keep alive. 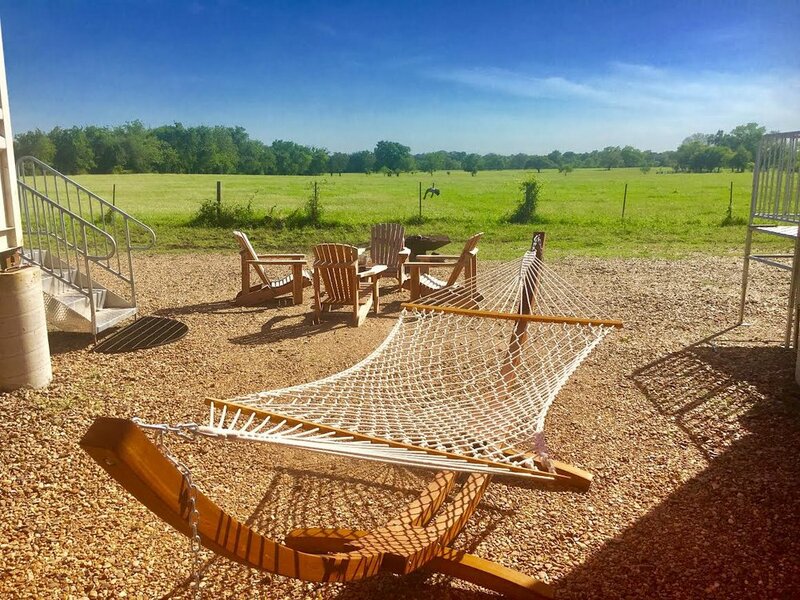 Outside there is plenty to see and do, and as our guest, you get access to all 10 acres with complete privacy, all while being right next to everything Warrenton and Round Top has to offer. Oh, and did we mention you have access to our shipping container pool as well as 10% off at our on-site store Recycling the Past? Head on over to our Flophouzes for more fun during your stay! This renovated early 1900s farmhouse sleeps up to 10 with a fully stocked Viking kitchen suite, amazing interior, Matteo brand linens - every detail has been thought of! Off the kitchen is a private master bedroom suite with full bath and its own porch. Three additional bedrooms share a full bath with walk-in shower. The second bedroom has 1 queen sized bed. Third bedroom has 2 sets of twin bunks and the fourth bedroom has 1 twin bunk. Large front porch for viewing beautiful sunrises and a back porch for the famous Round Top sunsets and entertaining. Soak in the Victorian clawfoot tub while enjoying your favorite libation or relax by a campfire under the stars and do some grillin’. There is plenty to see and do on the property as well. 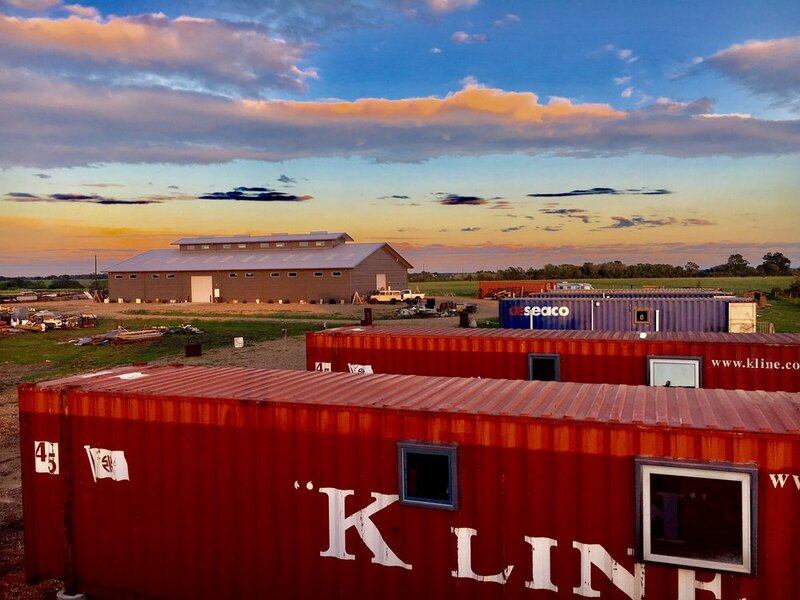 The FarmHouze is located on a very private 2-acre parcel next to Recycling The Past and The Flophouze Shipping Container Hotel. Guests of the FarmHouze may access the shipping container pool at The FlopHouze which is only a short walk away. Bikes are available as well for those who want to get little exercise. The interior was designed by Webber/Wheeler of Seattle, WA and furnished by Recycling The Past. All items in the home are FOR SALE as well - so you can leave with that art you admire. Our entire property is available for private events, corporate gatherings or wellness retreats. Recycling The Past, The Round Top Ballroom, The Flophouze Hotel and The Farmhouse can all be reserved for special occasions. One of the many perks of staying at Flophouze is our 12,000 sqft on-site store + curiosity showroom- Recycling the Past. This building is packed with some amazing finds that you will be sure to love- all of which can be charged to the card at your convenience to the card you reserved your booking with. Also, as our guest you'll get to enjoy a complimentary 20% off your purchases during your stay for up to 100$! We have no rules... just reallllly strong suggestions! Please respect your neighbors. Keep it to a low roar till 11 - then use sign language. Beverages and snacks upon your arrival can be customized at an additional fee. We must obey the burn bans - if it's NO, it's NO, and tickets are expensive. But, we can have bonfires then marshmallows and smores for all! We like to respect our guests' wishes by not allowing smoking within 50 ft of the houzes. Rates apply to two guests, any additional guests will be $25 per person/per night - except at BeachHouze, weekly discounts available. The cleaning fee is 50$ per stay. Guests staying for longer than 3 days can request to have their unit cleaned for an additional cleaning fee - simply give us a shout and we'll set you up.